Glow In The Dark Slime Recipe – My Kids Favorite! 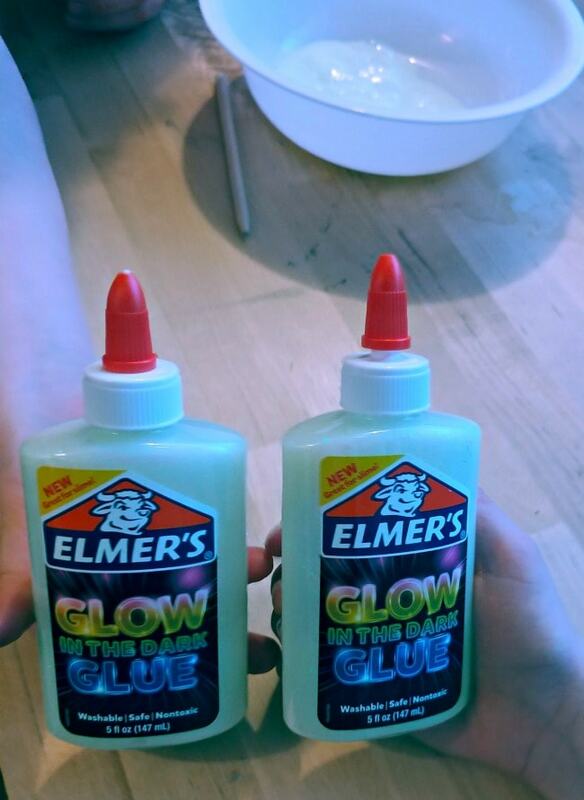 Did you know that Elmers makes Glow in the Dark Glue! My kids where so excited when we found out about this, because they immediately thought of making Glow in the Dark Slime! Since you can start with glow in the dark glue, this glow in the dark slime recipe is as easy as making any other slime recipe your kids love to make. 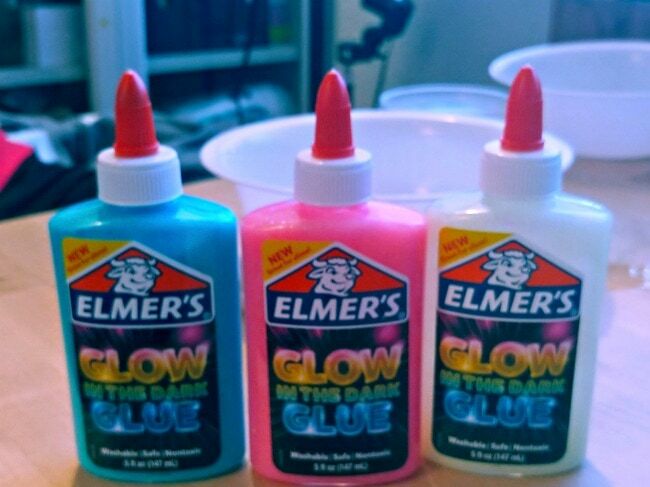 Just start with the Elmers Glow in the Dark Glue, as your base for the recipe. 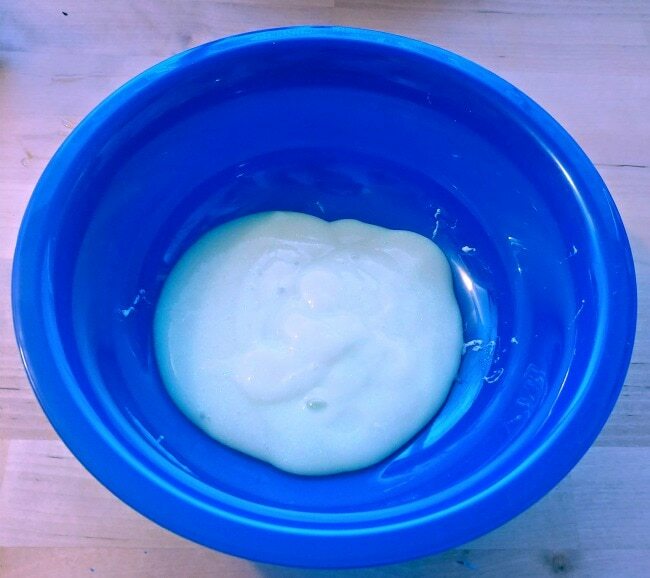 We recently made a few batches of the glow in the dark slime, and used the regular slime recipe found in our free printable slime recipes sheet here. 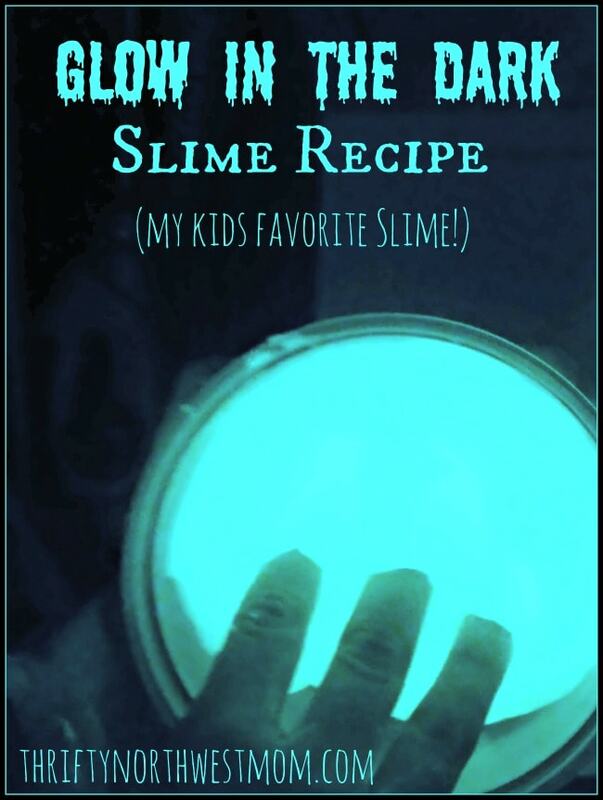 The kids loved it, and said it was their new favorite (in full disclosure, they often say that with the new slime recipes, but this one really is cool!). This recipe is great in the sense that you do not need any extra special ingredients, you just need to switch out your regular white glue or clear glue in your slime recipes, for this glow in the dark glue. It is that simple. And yes, it really works! 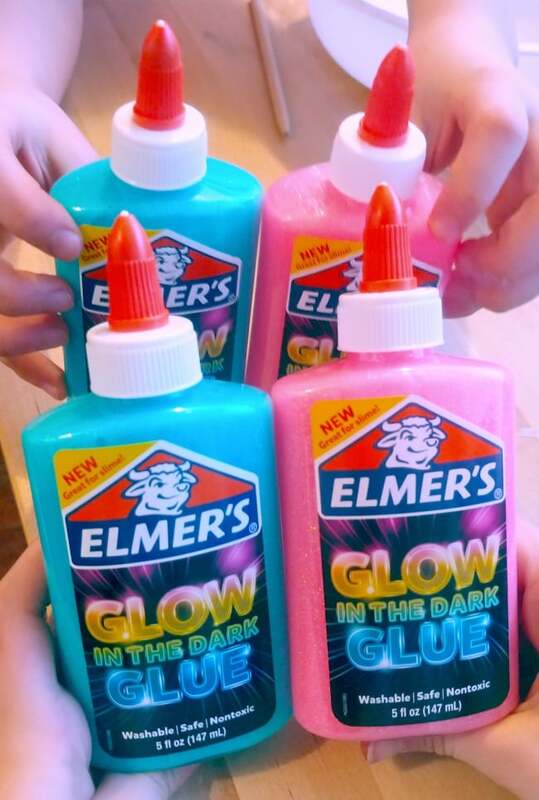 Just look for the Elmers Glow in the Dark Glue. We used one 5 oz container per batch of slime. We used three different colors – blue, pink, and clear/yellow. They all glowed well. You could add glitter to your mix too, or other mix ins. We started with the clear or yellow color (not really sure what that one would be called officially). Pour one container into a bowl, and then use your favorite slime recipe to make it. 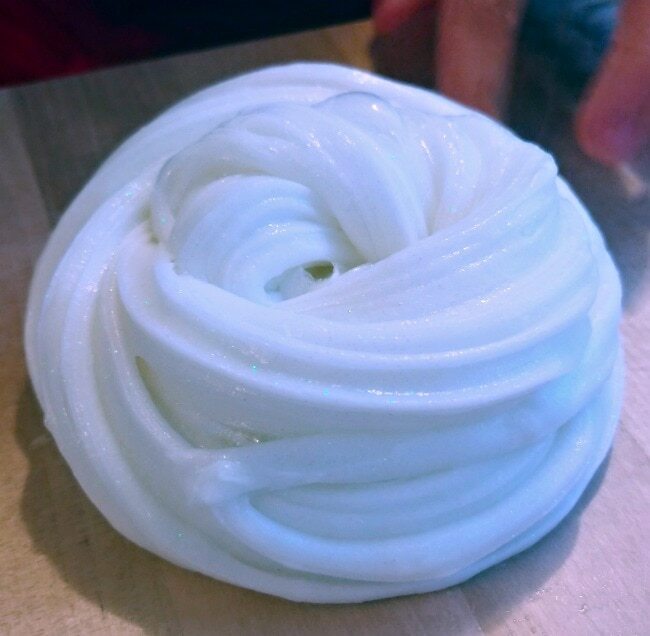 We used Sta Flo as the activator for this batch (find our regular slime recipe here). 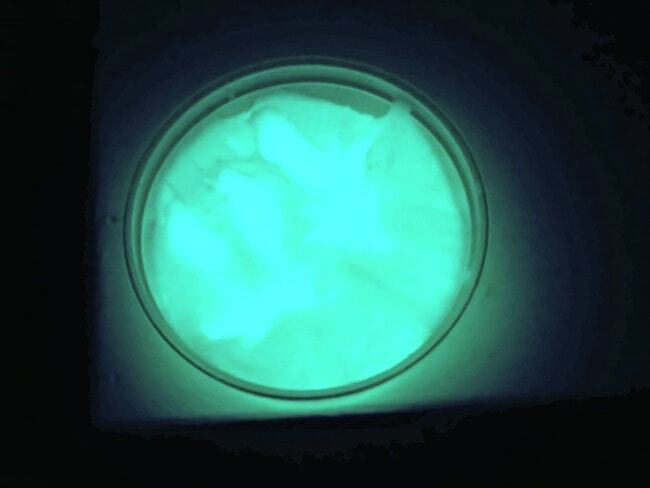 This is what our slime looked like in the light. Evidently the kids call these poop rolls, and my kids actually practice making them (eek!). And this is what it looked like when we turned out all the lights! It really glows, and my kids loved it. They play with it like regular slime, but it was also fun to watch it glow. How to make your own DIY Slime Kit (great gift basket idea for birthdays and more)!